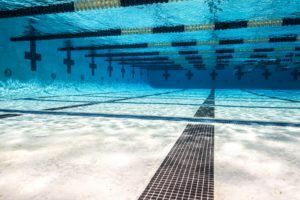 Gates Mills Hawken dominated the girls meet – winning two of the three contested relays – and extended their Ohio Division II state championship win streak to twenty-one years in a row. Their final team score of 378 easily cleared Shaker Heights’s second place score of 167.5. Hawken kicked off the meet with a commanding win in the 200 medley relay. The team of Jessica Eden, Sydney Bare, Abby Hay and Audrey Dietz touched the wall in a final time of 1:42.35, almost four seconds ahead of the rest of the field. Cincinnati Mariemont’s Cora Dupre, who recently changed her commitment from Texas to Indiana, had a phenomenal state meet to cap off her high school career. In the 200 free, Dupre topped the field with a blistering 1:45.91, breaking the state record of 1:46.96 set in 2015 by Alexandra Wooden. Dupre doubled up on individual wins with a state title in the 100 free, stopping the clock at 48.97. Also joining her under the 50 second barrier was fellow senior Amy Fulmer out of Bellefontaine, registering a 49.80. Hawken senior Abby Hay was tangential to her team’s success. The senior won the 200 IM in a time of 2:00.90, well ahead of runner up of Jordan Aurnou-Rhees from the Columbus School for Girls, who finished at 2:02.71. Later on in the meet, in the 100 fly, the two swapped positions – Aurnou-Rhees finished first with a 55.23, while Hay touched right behind her at 55.34. In the 200 free relay – the only relay that Hawken didn’t win – St Ursula Academy’s squad consisting of Molly Dynada, Corrine Stewart, Catherine Knight and Audrey Cesar bested the field with a combined time of 1:36.37. Beloit West junior Jamyson Robb set a state record in the 100 breast – her final time of 1:01.38 easily cleared the previous state mark of 1:02.57 set by Kendra Crew back in 2013. To add a cherry on top to their all but announced state title, the Hawken quartet of Ella Grison, Maggie Mallett, Abby Hay and Jessica Eden took the 400 free relay state title, clocking in at 3:29.64. Representing the Columbus School for Girls, sophomore Nyah Funderburke won the 50 free in a swift 23.46. Hawken’s Tori Culotta had a stellar freshman debut – she won the 500 free with a 4:51.02. Sophomore teammate Claire Pophal completed the 1-2 sweep for Hawken with her second place time of 4:53.25. 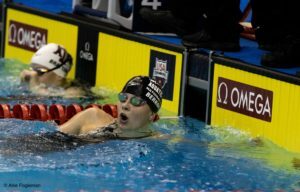 Emma Shuppert, a senior from Cincinnati Seven Hills, capped of her high school career with a state title in the 100 back. Her time of 53.93 marginally missed Hannah Stevens‘s state record of 53.87. 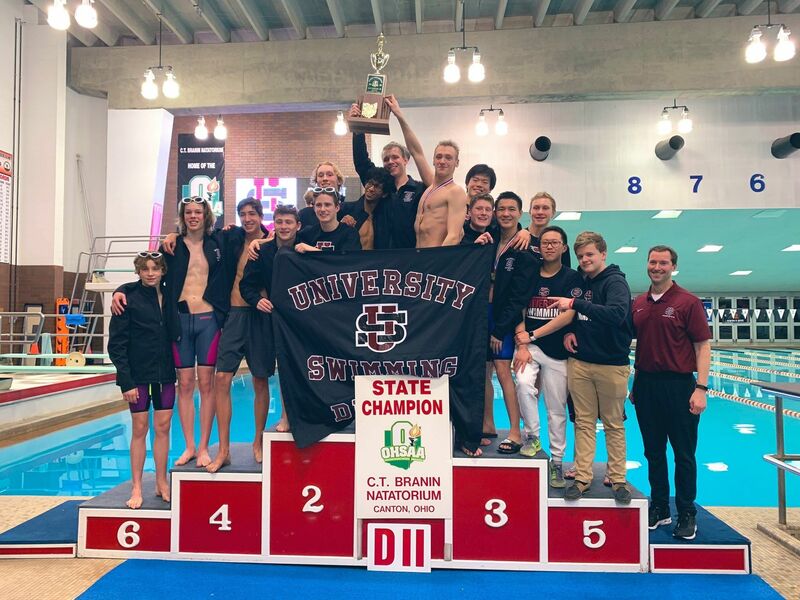 The Hunting Valley University School boys team defended their Ohio Division II state title from last year, sweeping all three relays and winning the meet with a final score of 331, well ahead of the 212 points registered by runner-up Gates Mill Hawken. 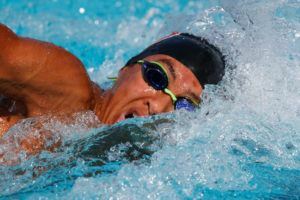 Nicolas Tekiele, Cal Ritzmann, Frank Applebaum and Will Zhang teamed up to tee off Hunting Valley’s meet with a victory in the 200 medley relay. They finished in a time of 1:33.32, ahead of Cincinnati Seven Hills’s 1:34.96 for second. 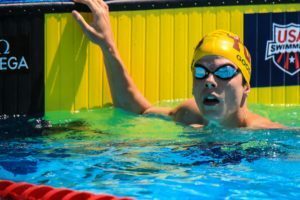 Junior Owen Conley out of Waynseville swam an unusual double – entering in both the 200 free and 200 IM – but it paid off. 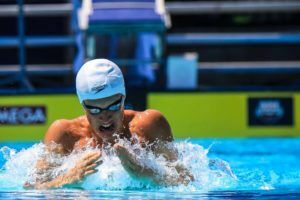 He first claimed the 200 free in a time of 1:37.07; the only swimmer in the final to break 1:40. Shortly after, Conley broke his own state record in the 200 IM. 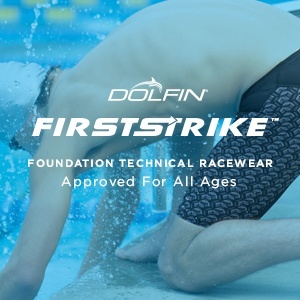 His finals time of 1:48.52 dropped his old record of 1:48.94 by a couple tenths; and impressive feat given that he swam the 500 free last year (which, by the way, he also won) instead of the 200 free right before it. Alliance’s Will Rose was also a two-time individual event winner. 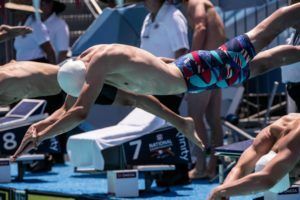 The junior first won the 100 fly with a 48.02, then followed that up with a victory in the 100 free, touching the wall in 45.29 – a second ahead of second place. Hunting Valley got an individual event victory out of senior Owen Hannah in the 100 back. He bested the competition with a 48.40, beating out Cincinnati Seven Hills’s Greg Kalin, who touched second at 49.88. In the final individual event, the 100 breast, Bowling Lane junior CJ Layne (with a very fitting last name to boot) broke Andrew Malone’s eight year old state record of 55.54 with a time of 54.48. 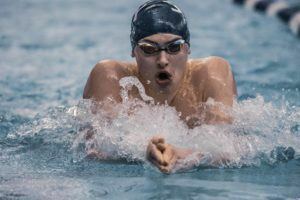 The championship final of the 50 free was solely comprised of seniors – Canton Central Catholic’s Joey Mullen reigned supreme, winning the event in a time of 21.23. Kettering’s Kevin Leibold, a Cincinnati commit, dominated the 500 free. His winning time of 4:25.94 rendered him the only competitor under 4:30. Ilya Gerasimchuk claimed the top spot in the 1m diving event, accumulating a final score of 452.90. Great swimming. Edit the headline please. University School Boys and Hawken Girls repeat.